The only playoff hockey in Metro Vancouver this year will be played in Langley. 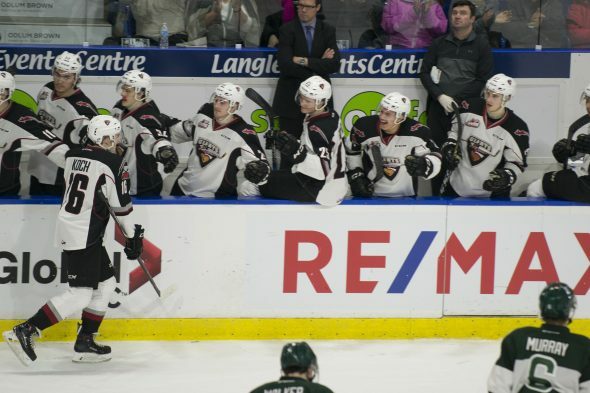 The Vancouver Giants are on their way to their first playoff appearance in four years after wrapping up the regular season with a double header against the first-in-the-west Kelowna Rockets. The Giants will face the Victoria Royals in the first round, playing game one on Friday, March 23. The playoff berth was hard-earned by a young Vancouver team that has struggled in recent years. This season, things finally came together for the team, but the Giants have a tough road ahead. The Giants’ breakout season can in large part be attributed to the elite play of star forwards like Ty Ronning—who signed an entry level contract with the New York Rangers this month—and Tyler Benson. Credit must also go to their fast, puck-moving defence that, on the best nights, can reliably generate offensive opportunity, as well as their vital stability in net fostered by rookie goaltender David Tendeck. What’s working against the Giants is a lack of experience. The team has just eight players on the roster who have previously appeared in the WHL. Among the playoff first-timers are key players like Benson and Dylan Plouffe. Ronning has just two playoff games under his belt from his rookie campaign with the Giants in 2014. Unfortunately for the Giants, the team’s inexperience was on display during the final weekend of the regular season. The Giants lost to the Rockets 5-2 on Friday despite outshooting their opponents 39-26, failing to take advantage of power play opportunities as the Rockets made good on the Giants’ offensive slip ups. The Giants followed that up with a devastating 8-1 loss in Kelowna. The Victoria Royals don’t share the Giants’ lack of experience. The Royals have made the playoffs every year since moving to Victoria from Chilliwack in 2011. Consequentially, most of the team’s roster is well-acquainted with the more intense playoff hockey. “They’ve got good speed, they’ve got good depth, and they’ve got a lot of experience, and they got good goaltending,” McKee says of his team’s round-one opponents. The Royals finished the regular season with a record of 39-27-4, and are 8-3 against the Giants in the 2017-18 season. The Giants played perhaps the most exciting game of their season against the Royals in a Feb. 17 nailbiter in which the Giants tied the score.